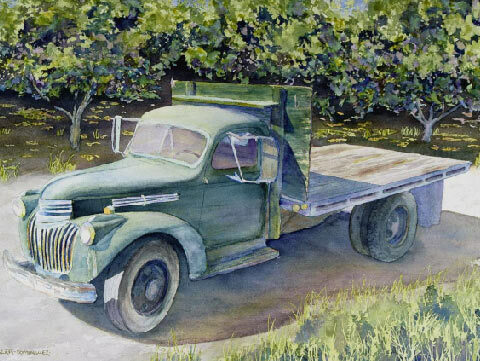 The Green Goose, a 1946 Chevy truck, spent the better part of a career on the Chambers Family Farm, just north of Albany, on Dever Conner Road. Two generations of Chambers men, beginning with Elbert and ending with sons, Wayne and David, used this sturdy workhorse in the hazelnut orchards, primarily as a water truck and for hauling totes of nuts to market. In the off season, she earned her keep hauling everything from prunes to beans to corn to table beets. Wayne keeps her in beautiful running condition, but for the past decade he has given her a pass on harvest duties. Among the treasures of Oregon’s fabulous Willamette Valley are orchards producing more than 99 percent of the domestic hazelnut crop. And even though, by world standards, we’re ranked as number three in production, behind Turkey and Italy, Oregon hazelnuts are considered the best. One of its early growers was Ferd Groner. And like so many within the industry, Ferd has an interesting story. In 1880, at the age of 17, Fred helped his family build a grand Victorian-style house, one brick at a time. The historic estate still stands 20 miles southwest of Portland, where Scholls Ferry Road and River Road intersect. After taking over the family business 11 years later, when his father died, Ferd soon built a farming empire around hay and walnuts. Somewhere along the way he also put in a hazelnut orchard, which grew to 200 acres. It wasn’t until 1943, when he was 80, that Ferd decided he needed some help with the orchard. His ad in The Oregonian was answered by Andrew Loughridge, who had a wife and infant son to support and needed the work. To the questions posed by Ferd, “Do you smoke? Do you drink?” Andy was able to answer in the negative. Ferd took a shine to him and even invited the family to move into living quarters on the lower level of his brick mansion. The Loughridge family lived in the main house for about a year before moving to another house on the estate. A few short years after that, Ferd died. In his will, he bequeathed half of the orchard — 100 acres — to Andy. And so, for the next 60 years, Andy grew hazelnuts. It was a life that suited a man with such a strong work ethic, with the consistency of its year-round demands. His barn-like red nut dryer, with its iconic cupola, drew customers from near and far. Others came to Loughridge Farm to buy nuts. And after Andy filled up their bags and weighed them, he always topped off the purchase with a few extras — just in case there were some bad ones. 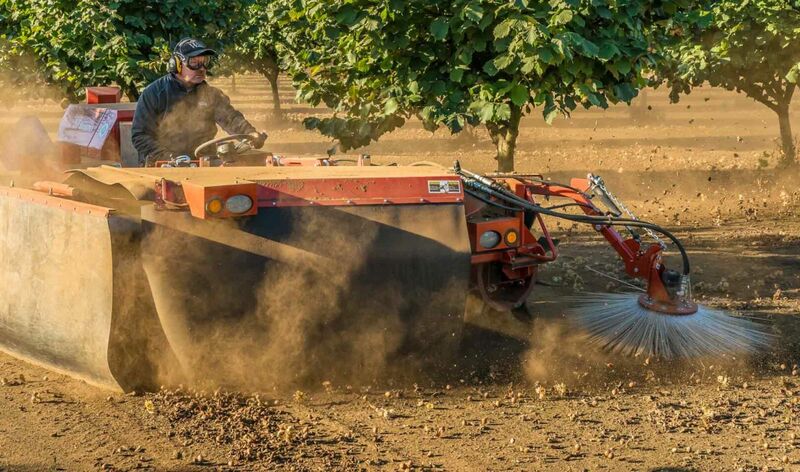 These days, hazelnut growers can’t necessarily count on $1 per pound, but they do get to put in the same hard work as always. Briefly, it goes like this: Hazelnuts bloom in January with tiny red flowers gleaning pollen from large yellow catkins. Trees leaf out in spring and the fruits mature over the summer, falling to the ground of their own accord in mid-September to early November. Along the way the orchards are meticulously cared for and groomed. Once the nuts are on the ground, they are mechanically swept into long windrows, and then scooped up with a tractor-drawn harvester and poured into large totes. The totes are typically delivered to a “handler,” which is a business specializing in cleaning, drying, bleaching (to sanitize), grading, inspecting, and packing whole and shelled nuts for distribution. Some also roast kernels and even produce value-added products such as retail-packaged nuts or confection. Well, the hazelnut harvest is wrapping up for another year. This translates into farmers markets and supermarkets bringing in “new crop” hazelnuts. Here are a few ways to relish their goodness. Jan Roberts-Dominguez is a Corvallis food writer, artist and author of “Oregon Hazelnut Country, the Food, the Drink, the Spirit,” and four other cookbooks. Readers can contact her by email at janrd@proaxis.com or read her blog at www.janrd.com.